Stackable modular hood (As per Cokin that allow you to attach several modular hoods to each other like P255). Dimension: 100mm x 100mm x 20mm. Black Plastic. Content 2 x Filter hood. Ex-Pro Square filters lens hood for Cokin P-Series holder P255 use to protect your Cokin or similar lens kit from Light Flares, dust etc.. Fits to Cokin P Series Filter holders or similar brands. 100% Compatible with Cokin P series. (Same part as P255). Stackable modular hood (As per Cokin that allow you to attach several modular hoods to each other like P255). Stackable modular hood (As per Cokin that allow you to attach several modular hoods to each other like P255). Dimension: 100mm x 100mm x 20mm. Black Plastic. 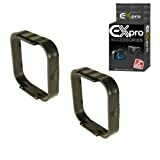 2 x Ex-Pro Square filters lens hood for Cokin P-Series holder P255. Please note where possible during 2014 our ecommerce orders will be shipped in Eco-Friendly Easy open frustration free packs not retail boxes reducing packing waste. This entry was posted in Discount Photography and tagged Cokin, ExPro, Filters, Holder, Hood, lens, P255, Pack, PSeries, Square by Ball Photo. Bookmark the permalink.